Founded in 1876, the Mount Holyoke College Art Museum stands among the oldest teaching museums in the country. Like many such esteemed institutions, its history unfolds through countless unique chapters, each one shaped not just by the talented individuals who oversaw its development, but also by a multitude of remarkable objects. Today, over a century and a half since its opening, the Museum houses over 17,000 works of art and objects of material culture, as well as oversees the Joseph Allen Skinner Museum. What follows is a brief outline of its intriguing history. One of the earliest sectors of MHCAM’s collection comprises a few hundred items that were sent back to South Hadley by intrepid graduates of the Mount Holyoke Female Seminary. Although the Museum had not yet been founded, this missionary collection was housed together in the original Seminary Building as “curiosities” from around the globe. Proudly donated by Mrs. E. H. Sawyer and Mrs. A. Lyman Williston, wives of two Mount Holyoke College trustees, Albert Bierstadt’s 1875 canvas, Hetch Hetchy Canyon, was the inaugural gift to the Art Gallery. Housed on the top floor of the new Lyman Williston Hall for Art and Science, the gallery displayed objects from the missionary collection as well as this and a few other early paintings. This first art acquisition fund, established on the occasion of Elizabeth Blanchard’s retirement, was primarily used for the purchase of reproductions that would aid in the edification of students. Ancient art and archaeology scholar, Louise Fitz Randolph (Class of 1872), chaired the newly formed Department of Art and advocated for a building in which to house art resources. Funded by former South Hadley resident, John Dwight, as a memorial to his late wife, Nancy Everett (Class of 1839), the Dwight Art Memorial Building provided classroom space, a library, and areas for the display and storage of art. It also housed the collection of works by the noted American illustrator Elbridge Kingsley that were acquired by Dwight’s second wife. 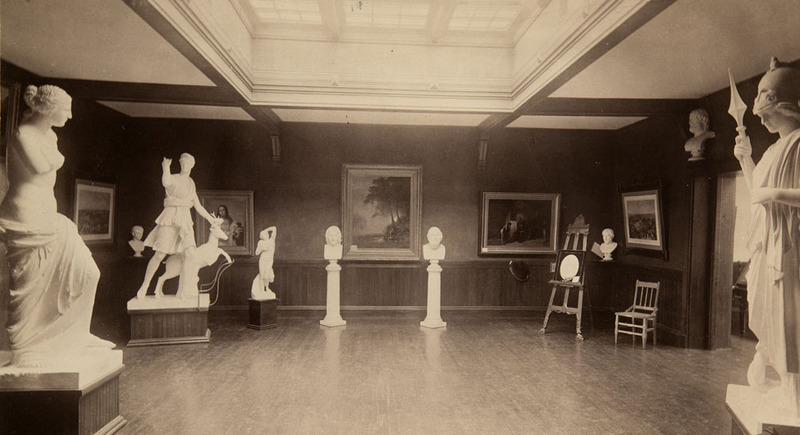 Beginning in 1904 and continuing over a number of years, Louise Fitz-Randolph coordinated gifts of full scale plaster casts to the College from which the History of Art could be taught. Until the 1950s, this cast collection dominated the main floor of Dwight Art Memorial. Established by members of the John Dwight family, this endowment transformed the collection with the acquisition of original works of art rather than what had primarily been reproductions up to this date. Art History Professor Caroline Galt established the Friends of Art to support exhibitions and bolster the artistic life on campus. Under the direction of a committee of faculty members, it produced up to eight exhibitions a year. Joseph Allen Skinner (1867-1946), a local textile industrialist, acquired and organized an eclectic collection in the 1930s and 1940s and gave it to Mount Holyoke College in 1946, along with property, two carriage houses, a schoolhouse and meeting house relocated from the town of Prescott prior to the construction of the Quabbin Reservoir. Designed by Hugh Stebbins, the Art Building was established to provide teaching space and house the collection, which had far outgrown its display and storage space in Dwight Art Memorial. Previously managed by a committee of faculty members, the Museum was bolstered by the addition of the first professional staff member in 1974. Click here to read a tribute to Wendy Watson, written upon her retirement in 2015. Designed by Nicholas Garrison of The Hillier Group, this sizeable renovation of the art building and expansion of the museum added 3,400 square feet to the 1971 structure. Click here to read a tribute to Wendy Watson, written upon her retirement in 2015. History is always in the making, and as we continue to add to this timeline, we welcome your suggestions for additions and corrections. Please email your comments to artmuseum@mtholyoke.edu.